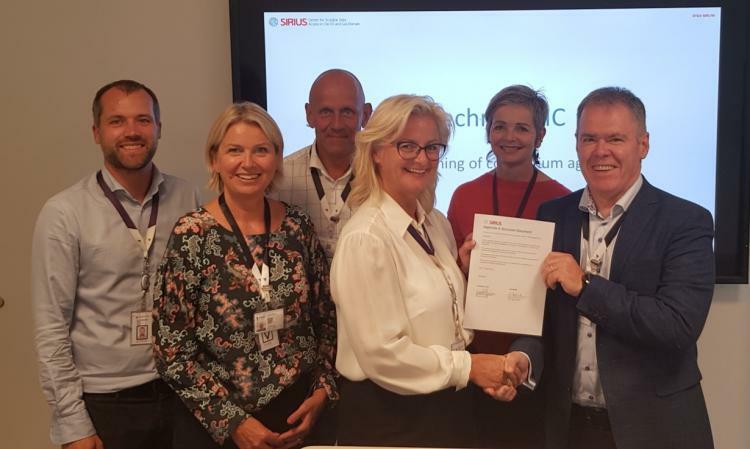 The University of Oslo and TechnipFMC have signed a collaboration agreement that brings a large industrial company in as partner in the SIRIUS Centre. TechnipFMC is Norway’s largest oil service company, with over 37000 employees worldwide. In Norway, Ann-Christin Andersen has the global responsibility of the company’s work in digital transformation. She views this collaboration with the University of Oslo as a way of ensuring access to cutting-edge research in the use and management of large amounts of data. The agreement was signed at TechnipFMC’s offices in Oslo on 10th August 2018. The picture shows David Cameron, the SIRIUS Coordinator with Ann-Christin Andersen. The University of Oslo was also represented by Dean of Mathematics and Natural Sciences Morten Dæhlen and Vice-Dean Kristin Vinje. TechnipFMC was represented by Elisabeth Nøst and Knut Johannesen Vidvei.